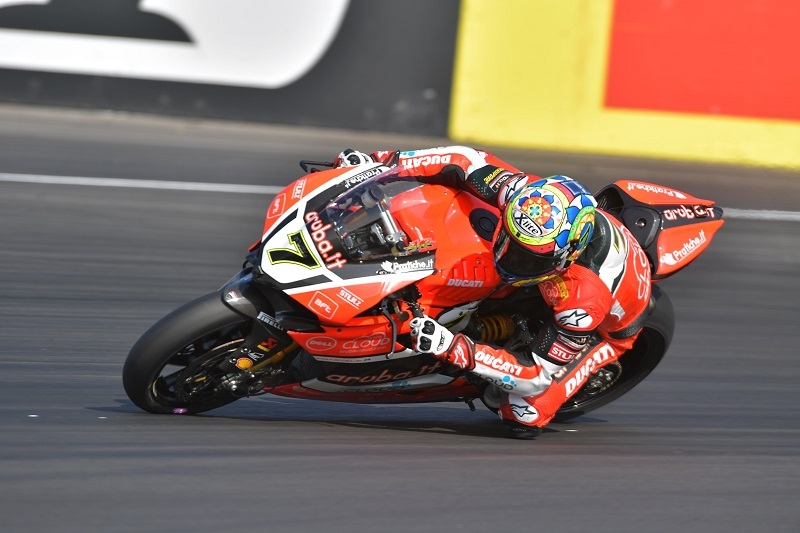 The Aruba.it Racing – Ducati team resumed action at EuroSpeedway Lausitz (Germany) for the 10th round of the WorldSBK Championship. At the end of the first two free-practice sessions on the German track, the only novelty in the 2016 calendar, Chaz Davies and Davide Giugliano sit in 4th (+0.207) and 13th (+1.126) position respectively in the combined rankings. In mild climatic conditions (with temperatures around 25 degrees) Davies gained direct access to Superpole 2, improving his lap times by about seven tenths of a second and missing provisional first row by only 0.099 seconds while posting the fastest ideal time. Giugliano, on the other hand, encountered some unexpected difficulties and, also due to particularly narrow gaps in the time sheets (with only four tenths of a second separating the 10 fastest riders) and some traffic encountered during his last exit on new tyres, will take part in Superpole 1. Both riders will be back on track at 08:45 local time (CET) tomorrow for the third and last free-practice session. Race 1 is scheduled for 13:00.